I recently found a box of cross stitch crafts I’d made years ago when I was a stay at home Mom. 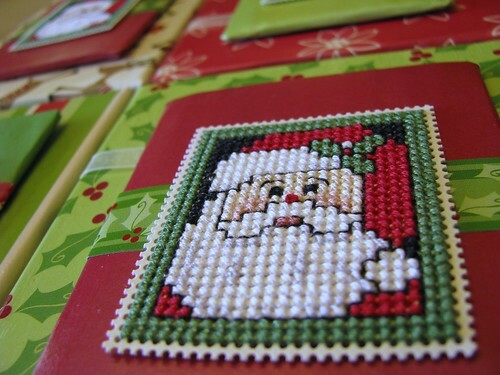 There were a few tiny Santas stitched on perforated paper, a little larger than postage stamps, that I think I’d intended to use on little photo albums. But in our digital age I don’t print many photos – this didn’t seem like a good use anymore. I decided they could just be “decorative Christmas art”. 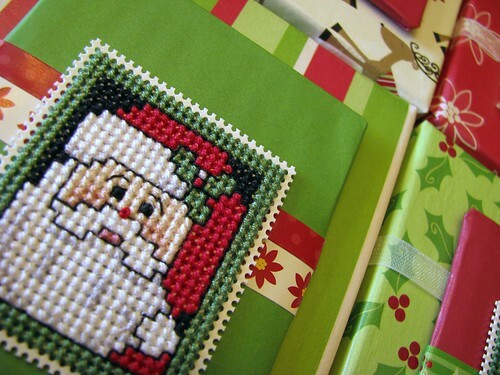 This craft would work just as well with a little Christmas embellishment in place of the Santa. 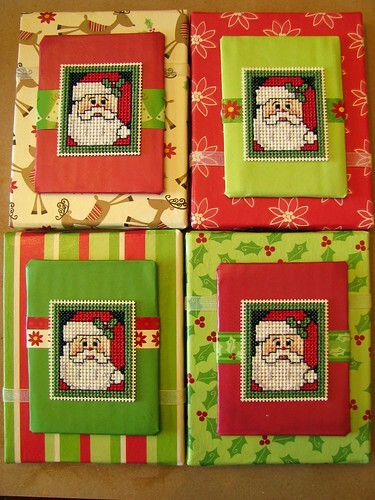 You’ll need Mod Podge, a variety of scrapbook papers, little canvases, some spare cardboard, glue, some ribbon and your embellishment. 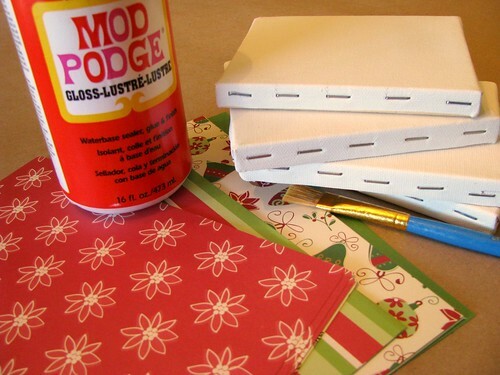 First, cut a piece of paper large enough to wrap around the front, sides and just over the back edge of your canvas, then brush a layer of Mod Podge on the back of the paper and the canvas itself. 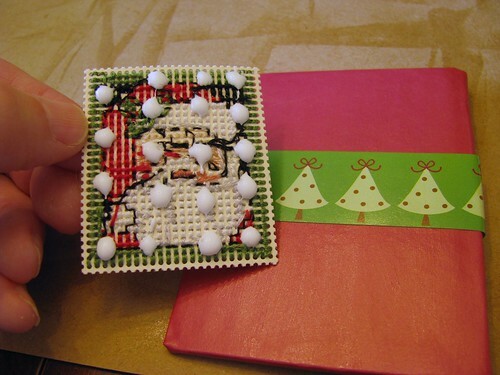 Wrap it just like a gift, using extra Mod Podge to hold the paper in place. I used glossy Mod Podge, so I also brushed a layer on the outside of the paper for added sheen. Cut a piece of cardboard smaller than your canvas and cover in the same way. As your cardboard section dries, you can add a little ribbon to your canvas piece if you’d like. 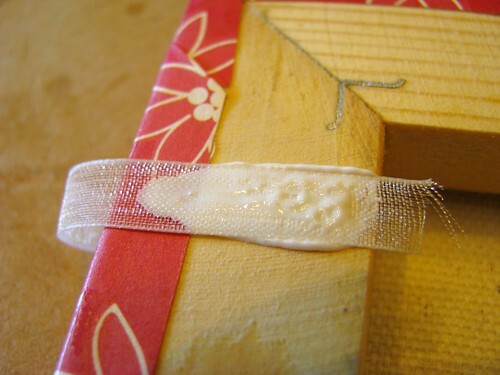 Cut a length of ribbon and glue both ends to the back of the canvas. 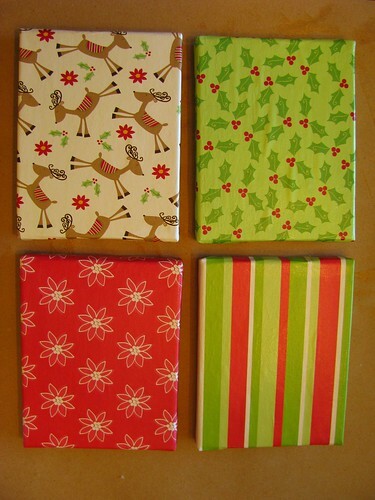 The set of Christmas papers I purchased also had coordinating Christmas stickers, so I added these to the cardboard pieces. Once all your pieces are dry, it’s time to glue them together. Embellishment to cardboard piece, cardboard on canvas. After allowing more drying time, you can make the back look a little neater by gluing on another piece of paper to cover. I’ll be including little easels when I give these as gifts. I feel a little more prepared for Christmas already!